Three different people who all taught me, by example, the same thing: This distillation of wisdom and attitude is going to become the principle for the new yoga business in Cape Town. Sachin Tendulkar recently retired from cricket. Considered the greatest batting talent ever and virtually worshiped as a living deity in India. 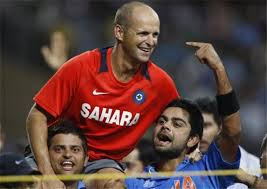 Gary Kirsten is an ex-South African opening batsman (Read that as composure under immense pressure) and coach. As coach, Gary lead the Indian team from the bottom to the top of the cricket world then did the same with the South African national team. He is probably the most sought after coaching brain in the world. Simon Borg-Olivier is not a sportsman but a scientist and pioneer of the field of Teaching Yoga. His teaching style and practice method is unique, incredibly effective, and revolutionary. This connection might take a bit of time to explain, so if you would like to see the summary, then please feel free to scroll down to the end section. If you can bear with me, I would like to share three anecdotes that, on reflecting on them at three am (jet lag) and came together for me. I am putting it out there, as I tend to do in these writings, as a communication of my own musings. And it is also a statement of my intent as to how I plan to work in the new yoga studio. Like Rama from the Ramayana epic. He is loved by all people in India. Soft spoken and small in stature, they called him the little master. At training he is just like one of the others. He works on his fielding, his batting and bowling. He supports the younger players with advice. Every time he gets a century he doesn’t take the credit but raises his eyes to the heavens in gratitude and salutes the crowd with his bat held high. It’s as if it’s not about him really but he is a conduit for something. For the excellence and power that is possible with dedication. But what I really got from him was this (and this is inside info from the Indian Team room): Every batsman feels the pain and disappointment of being gotten out. Each one deals with it in his own personal way. When a batsman comes in he is usually given a polite applause or a hearty applause depending how well he did for the team. Some come in fuming and swearing in frustration a few shrug it off more easily, but always, there is a process of re- entering the team room having made a mistake. The mistake in the field has affected the outcome of the game and hence the fortunes of the team. The other players generally allow the man space until he can bring himself back to the group. Sachin would come in with a very dark cloud. Whether he had made a century or a duck, he always had to go and sit alone for a long time. He would run over the events in his mind. Analyse the story of his innings, how it unfolded, and review the final scene where he was caught or tricked in some way by the bowler. The scene had to be told and re told in his mind until understood and learned from. From this process he could stay vigilant. He could learn from the mistake. He was never too big, too famous, too much of “a master” to let go of this process. This is the lesson I learned from Sachin just by being around him,mastery comes from vigilance. When I first met Gary, it was at a five star hotel in Cape Town, I had been hired by the Indian team as their Yoga Consultant, which was an extremely out of the box idea for a national cricket team. Gary was the head coach at the time. He was fifteen minutes early for our meeting. I found out later that he is always fifteen minutes early for everything. It was one of his things. He is another super humble super hero. He consistently refused media interviews, and photo opportunities. Always in the background until eventually, after 4 years of preparation, his team won the world cup and he was given no choice. He was lifted up on the shoulders of the team for a victory lap. He became a national hero to a billion cricket loving people in India. His discipline, consistency and attention to detail every day had borne fruit and the team had vanquished all comers. The message that Gary taught was this. Take care of the details of preparation, (your own actions). And then trust your instinct and surrender to the flow of the game. Don’t be attached to the outcomes that are beyond your direct control. This, by the way, is straight out of Indian Philosophy. Gary was telling the Hindu players something that they could probably relate to because it is a fundamental tenant of the Bhagavad Gita. The Gita says you have no ownership of the results of your actions but only responsibility for taking your actions. It says act correctly and then surrender the results. The results aren’t yours. I don’t think Gary would consider this a philosophy but rather an attitude that he has and that had served him well in his many years as a opening batsman. So he was doing the same thing as Sachin. It was a post class analysis. Looking for how he could have done it differently and better. After thirty years of teaching, he still searches for improvement. This is evidence of a kind of dedication that brings mastery. I think the formula may be something like this. (H+Atd)xE = M (Humility + Attention to detail) x Experience over time = Mastery Just a thought…. Jim Harrington speaks out. A message to the author of Natural Born Heroes.